Many Messiahs A case of the Christ complex. Intertestamental. There’s a word. The Old Testament ends with the book of Malachi and the New Testament starts with the book of Matthew. The span of time in between these two books is roughly 400 years where the Bible is silent. This is called the intertestamental period. An understanding of the events of this period can provide an entirely new context for the life and way of Jesus. Many claiming to be the christ (derived from the Greek word for messiah) would rise and fall in this period. In the book of Isaiah, a Messiah was prophesied to come as the Prince of Peace and establish the Kingdom of God. Today we know that the Messiah didn’t bring peace through violence, rather he showed us that peace is the way. Throughout history mankind has always assumed that peace had to be won through violence. This is how empire understands peace. This is how Rome understood peace. Violence was the solution to every problem. Jesus was born into a world addicted to violence. In the time between the Old and New Testaments, kingdom rose up against kingdom, nation warred against nation, and the Jewish people revolted with the sword time and time again. About 200 years before Christ, the Greeks who ruled over Israel banned the temple system of religion and killed all those who resisted. The zealous Jews wouldn’t stand for this though. 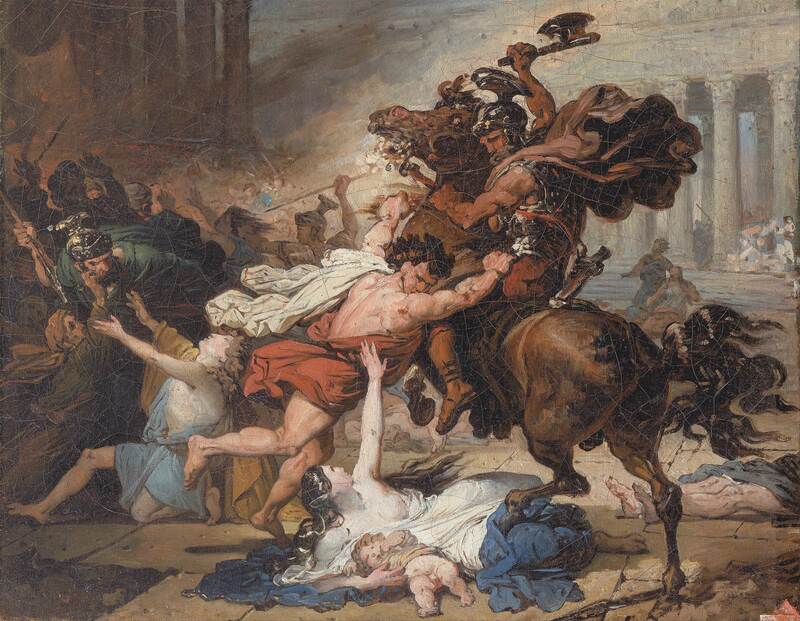 A revolt began, led by Judas “the Maccabee” (the Hammer), massacring thousands of Greeks. It would take a few decades, but the Maccabees reclaimed their religious and political freedom through violent force. Their success through the means of violence would come to shape the Jewish way of thinking and change the way they would understand ideas like the Messiah and the Kingdom of God. The insatiable lust for violence didn’t end after acquiring their freedom though. Jewish King, Alexander Jannaeus, created an expansive military to fight off the Greek invaders but soon they would be used to terrorize his own citizens. On one occasion he crucified eight hundred Pharisees, and according to Josephus, “butchered their wives and children before their eyes” while he “reclined amidst his concubines” and “enjoyed the spectacle.” On another occasion, Jannaeus executed six thousand Jews for throwing fruit at him during a festival.1 As bittersweet as it was, this “freedom” didn’t last long. The world Jesus entered was drowning in ruthless violence. Campfire tales of the Maccabean rebellion created patriotic fervor. Hands clutched to swords, the Jews waited in eager anticipation of anyone who would rise up and lead them to freedom once more. The reign of God became synonymous with the sword of man. A messiah who turned the other cheek, refused violence, and loved his enemies would not be taken seriously. Like every other messiah before and after him, Jesus was executed. But unlike every other messiah, his own people would choose his death. They wanted the sword, and they would get it. Three decades after the time of Jesus, two more messiahs (Menahem and Simon ben Giora) would lead a massive failed rebellion against Rome.5 Jesus had prophesied about it, and like he claimed would happen, Jerusalem would suffer complete destruction (Luke 21:6, 8, 20, 32). Despite the widespread expectation of peace envisioned by the Hebrew prophets, history had gone a different direction. The Maccabean kingdom cultivated a thirst for political independence through the sword. The true Messiah would go unrecognized by the majority of Israelites (Luke 19:41-44). His Kingdom was a kingdom of peace, set up without using violence. Enraging those around him, he claimed that citizens of this Kingdom were commanded to put down their swords and instead love their enemies (Matthew 5:44, 26:52). For a generation clamoring for a warrior messiah, this was unacceptable. Jesus frequently told his disciples not to tell others about his identity as the Messiah (Mark 8:29-30). This is because by the first century, the title of messiah was fraught with images of warfare and violence. Jesus, therefore, had to redefine what messiah meant to the ears of his Jewish followers (Mark 8:34-35). Instead of being a coercive, violent, power-hungry king, Jesus will be a suffering servant. Jesus goes further and says that He’s not the only one who will suffer. All of his would-be followers must deny the urge to use violence for protection, pick up their crosses, and suffer— if they want to be a part of God’s Kingdom. Welcome to Jesus’s upside-down Kingdom, where weakness is power, power is weakness, and suffering leads to glory. My kingdom is not of this world. If it were, my servants would have been fighting, that I might not be delivered over to the Jews. But my kingdom is not from the world. So what does Jesus mean by “my kingdom is not of this world”? The answer comes in Jesus’s very next words: “If my kingdom were of this world, my servants would have been fighting.” Nonviolence is at the heart of Jesus’s definition of kingdom. When Jesus says that his Kingdom isn’t “of this world”, he doesn’t mean it is spiritual rather than material. Jesus didn’t mean “my kingdom is not of this planet” (John 17:15). Instead, he means “the systems of the world”. Put simply, “world” means “the way of things outside the Kingdom of God”.6 Jesus’s “kingdom not of this world” is directly connected to God’s original intention with Israel in the Old Testament. God wants to set up an alternative kingdom, one that will have a different type of king and a distinct way of living. Jesus would make a bold claim that his Kingship and his Kingdom do not involve violence. Nonviolence becomes the focus as Jesus singles out physical fighting as the key difference between His kingdom and Caesar’s. Many messiahs would come and go (over 50 throughout history7), but Jesus stood out as the only one who went against the “ways of the world”. Every other would-be savior succumbed to the temptation of violence. While the pragmatic tool of violence was always on the table for Jesus, he never resorted to it. So was Jesus foolish? Cowardly? Or faithful? On Jannaeus, see Josephus, War 1.4.6. On Herod the Great, see Josephus, War 1.30– 33; for Archelaus, see War 2.1– 2. Pompey’s invasion is recorded in War 1.7 and reflected upon in Pss. Sol. 2. See Acts 5:36; Ant. 20.5, 97-99. See John 7:7; 9:39; 12:31, 47-48; 15:18-19; Bieringer, “My Kingship,” 171-170.